Finance Costs > How Much Does It Cost To Send A Package? How Much Does It Cost To Send A Package? Sending packages in the mail, especially during the busy holiday season, can add quite a bit of cost to your expenses. There are ways to save money, however, and there are many different companies that offer shipping services. Sending a basic letter or card in the mail will only require one stamp, which costs $0.47. This price is for letters and cards which weigh up to one ounce. For every ounce after that, the cost will increase by $0.17. If you choose to send your card or letter in a larger mailing envelope, it will require two stamps for a total amount of $0.88. Stamps can be bought in books of twenty or rolls of 100, but there is no discount for buying in bulk; each stamp will cost $0.47 regardless of how many you purchase. If you need to send a package, such as a movie or a box of clothes, there are many options. The United States Postal Service offers the Flat Rate option. This is a service that allows you to choose a specific size and shape of a box or mailing envelope and then charges one flat rate to ship regardless of the contents of the box. The supplies for this type of shipping can cost anywhere from $2 to $10, and the shipping itself can cost from $5 to $30 depending on the distance it is being shipped, the weight of the package, and whether you choose Express (usually overnight) or Priority mail (2-8 days). Shipping with the same flat rate boxes internationally will cost between $25-$50. The cheapest option through the USPS, however, is via media mail. This is only available for those who are shipping books, media-CDs, DVDs and videotapes. Restrictions will apply. UPS offers other options in shipping such as NextDay Air, 2ndDay Air, and UPS Ground. These services start at about $8 and increase to about $90 depending on the service selected, the size and shape of the package, and the distance it is to be delivered. Federal Express offers many different shipping options with time-specific delivery. For example, First Overnight will be delivered the next day by 8 or 8:30 am. The cost for this service begins at $46.30 for a 1 pound package delivered up to 150 miles away. The price increases by $4-$7 per 150-mile delivery increase and increases by $5-$6 per additional pound. Priority Overnight, which will be delivered by 10:30 am the next day, will start at $21 for one pound within 150 miles; Standard Overnight will be delivered by 3:00 the next day and starts at $18; 2nd Day shipping will start at $12, and Express Saver will start at $10.50. Each of these will gradually increase as the distance and weight increases, although the increase will not be as large as it is with First Overnight. If the packaging supplies are not included, you will need to purchase a box or envelope, tape, bubble wrap, etc. If you are shipping something very valuable, you are allowed to purchase insurance on the package itself. The price of this varies depending on the contents of the package and whether you want insurance against damage, loss, or both. All shipping services allow you to track the progress of your delivery online with a package tracking number. This service is not available with regular mail. Most delivery services come with a complimentary delivery notification. Shipping companies allow you the option of printing off your shipping labels and arranging for free pick up at your home. The best way to save money on shipping is to plan ahead and ship your package early. The longer you wait, the more expensive it will be. Using your own boxes and supplies can save you money; however, most shipping companies have requirements on what types of boxes can be used as well as restrictions regarding any writing on the box. 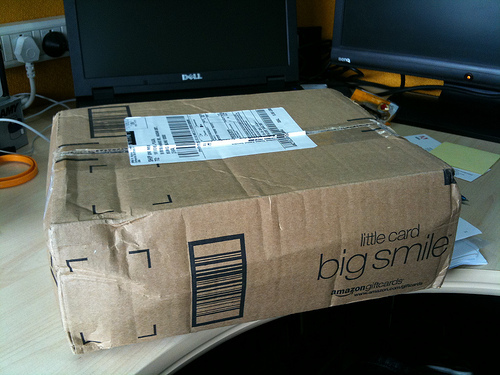 Avoid buying boxes from the shippers as this can often be the most expensive option. If you are going to be shipping multiple packages on a regular basis, each company has some type of loyal customer or frequent user plan that can save you money. Compare the big three shipping companies: UPS, USPS and FedEx. Through USPS, the cheapest option will be via standard post. This option can take up to eight days for delivery, but it is a good option if you’re not in a hurry. According to this CSMonitor.com study, they listed some scenarios and the Postal Service undercut its competitors every time.